By the time that your baby arrives, you will probably have a nursery full of furniture, a car seat, and a stroller. In all likelihood, your baby has more clothes than are wearable before they are outgrown and a nice selection of toys. Surprisingly, though, there is still more shopping to do! Babies grow and change surprisingly fast and the items that seemed so big when you first tried them on your newborn will soon be stretched to their limits. Before long you will need to buy t-shirts, all-in-one's, socks, and some outfits in the next size up. Although it can be tempting, try to avoid buying too far ahead since it's hard to judge exactly what size your child will be next year. After a few weeks at home, you'll begin to get an idea of what types of products might come in handy for you. If you find that you dread outings because you have to haul a heavy stroller and tons of gear just to head down the street, you may wish to purchase a sling or other type of baby carrier. Shopping and other errands can be so much easier when you can carry your baby hands-free, rather than pushing a pram everywhere. For those who live on the second (or higher) floor of a flat, a modern nappy pail might come in handy. Typically, a soiled nappy must be taken straight outside to avoid making your home rather unpleasant, and old fashioned nappy pails didn't really work well to keep odor contained. Newer models come with an ongoing roll of plastic bags that twist and seal each nappy in a covered bin, and many parents find that as long as the nappies are removed and discarded daily, there is no objectionable odor. Babies love to be active. It won't take long for your baby to enjoy movement such as rocking, bouncing, and jumping. It is a good idea for parents to encourage their babies' natural desire to keep moving -- not only will it help them to develop strong, healthy, bodies, but they will continue to associate activity with fun, which is a good life lesson. If you didn't receive one at your baby shower, you may want to consider purchasing an activity centre, walker, or jumper to keep your baby safely active. Once your baby can sit unassisted, there are even more products available that will encourage their growth and development. If you enjoy cycling, a bicycle trailer may be in order so that your baby can travel in comfort and safety. 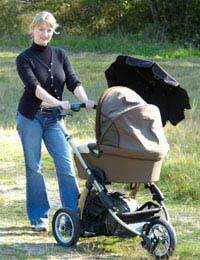 Jogging strollers and those designed to handle rough terrain are good choices for parents who are runners or hikers. By the time that your baby is just a few months old, you will begin to notice that they have a few favourite activities. Some parents swear that their baby just adores their swing and that there is no better way for the baby to relax in the evening and be ready for sleep, while others say that they couldn't live without baby's favourite music box. If there are a few pieces of equipment that your baby adores, you may want to consider purchasing duplicates to keep at their grandparents' house or other place that your baby visits regularly. The convenience of traveling light when visiting may be well worth the expense, and after your baby has outgrown the items, you may be able to recoup part of the expense by selling the items in an online auction. One thing that experienced parents will tell you is that you shouldn't buy too much in the beginning. Babies need very little beyond the most basic equipment and it is easy to get carried away when shopping for baby supplies. If you are in doubt, pass an item up. You can always go back to buy it if you change your mind. What babies need most is lots of affectionate attention and that doesn't cost a thing!